Also known as Chocolate Vine, these unique and beautiful vines are vigorous climbers on fences, walls, or arbors and can also be used as a ground cover. They bear profuse, wonderfully fragrant flowers which are said to smell like white chocolate and, depending on the variety, can range in color from very dark purple to white. Akebia can also bear a very unusual 4"- 6" long, edible fruit which when ripe, splits open to reveal a row of black seeds in clear sweet pulp that has a taste similar to tapioca pudding! The vines are excellent basket-making material and the young shoots can make a tasty addition to stir-fries. Hardy to -25°F (USDA Zone 4), Akebia can grow 6 feet tall and 10-12 feet wide. They can begin to bear fruit 2-3 years after planting and can bear 10-15 pounds of fruit at maturity. Must plant 2 different varieties for fruit production. Deep Purple™: (Akebia trifoliata) This rare, three leaf species forms a very attractive, semi-compact vine. Deep Purple™ is prized for its larger, deep green foliage and abundant, almost black, fragrant flowers. Purple Kimono™: (Akebia trifoliata) This popular Japanese variety is prized for its beautiful, reddish-purple, fragrant flowers, cascading, dark-green foliage, and large, tasty fruit. 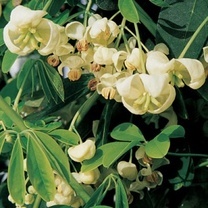 Shiro Bana: (Akebia quinata) This unique garden beauty from Japan features cascades of pure white, fragrant blossoms accented by attractive, deep green foliage. Silver Bells™: (Akebia quinata) One of the most vigorous varieties, Silver Bells™ is great for quickly covering a fence or arbor. Silver Bells™ features attractive, light pink, fragrant flowers and abundant, silver-blue fruit.